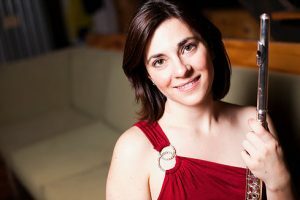 As a specialist in contemporary performance practice and techniques, flutist Shanna Gutierrez is dedicated to promoting and advancing contemporary music in cultural life today through innovative performances and educational projects. She appears throughout the United States and abroad as a soloist, teacher, clinician, and in various chamber collaborations, including Collect/Project and Sonic Hedgehog. She has performed as a guest with the Collegium Novum Zürich, ensemble interface, ensemble TZARA, and Fonema Consort, in addition to concerts and residencies in Germany, Portugal, Switzerland, The Netherlands, South Korea, Mexico, Colombia, and United Kingdom. With Matthias Ziegler, Shanna is the co-founder of FluteXpansions, an online resource for contemporary flute performance practice for flutists and composers. She is also the founder of Sonic Sculptures: A Journey in Sound, through which she presents concerts and workshops on contemporary flute music and techniques throughout the US and abroad.She has helped commission and present premiere performances of over 100 new pieces, including US premieres of works by Michel van der Aa, Malin Bång, Bernhard Lang, and Karlheinz Stockhausen. Shanna’s upcoming collaborations include those with Claus-Steffen Mahnkopf and Stefano Pierini, among others.She has received numerous awards and accolades for her performances including, prizes at the Stockhausen Courses, the Darmstadt Summer Courses for New Music, and a NewMusicUSA project grant. She was a founding member of Chicago-based Ensemble Dal Niente, with whom she received the 2012 Kranichstein Prize for Interpretation. Premieres and performances of pieces written specifically for her have led to appearances at such festivals as the Gaudeamus Muziekweek (NL), Sonic Fusion Festival (UK), Darmstadt New Music Courses (DE), BEAMS Marathon, International Computer Music Conference, Electronic Music Midwest, and Omaha Under the Radar. Shanna can be heard on several recordings, including the album Mobile with guitarist Jesse Langen, featuring world premiere recordings of music by Fredrick Gifford, and the album SORI featuring works by Kyong Mee Choi for instruments and electronics. Current recording projects also include a solo disc of works for her new Kingma open-hole bass and alto flutes, and a disc of Claus-Steffen Mahnkopf’s works for flute on NEOS. Shanna has studied contemporary music under Matthias Ziegler, Camilla Hoitenga, Eva Furrer, Philippe Racine, and Kathinka Pasveer. Such has served as indispensable enrichment to her performance studies at the University of Michigan (Amy Porter) and Northwestern University (Walfrid Kujala), where she received her masters and bachelors degrees, respectively. Her formative training was guided by Monty Adams and Dolores Humberg, to whom she is deeply grateful. She was also a former fellow of the Aspen Contemporary Ensemble at the Aspen Music Festival. A passionate educator, Shanna is on faculty of the Music Institute of Chicago, and maintains an active private studio in the Chicago area. She is also certified to teach the Suzuki method having received her training from David Gerry and Kelly Williamson. She performs on a Burkart flute and piccolo and Kingma bass and alto flutes.